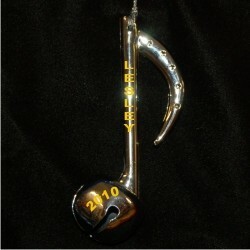 This stylish 8th note Christmas ornament with display cord is ideal for the tree, though some enjoy hanging it on a music stand or instrument case where it glitters just as bright. It is one of many music instruments available in our catalog, so you are sure to find just the right one for kids, teachers and music aficionados on your list. The classic 8th note ornament is made from durable resin and finished to gleam in holiday lighting for decades to come. Wish a very Merry Christmas to all with a versatile gift that includes our plush velvet pouch, the musical note ornament from Russell Rhodes.